The Election Petitions Tribunal sitting in Abuja, the nationâ€™s capital, yesterday upheld the victory of the All Progressives Congress (APC) governorship candidate in the July 14, 2018 election, Dr Kayode Fayemi. The Peoples Democratic Party (PDP) candidate, Prof. Kolapo Olusola, challenged the declaration by the Independent National Electoral Commission (INEC) of Fayemi as winner of the poll and lost. APC members trooped out in their thousands on the streets of Ado-Ekiti, the state capital, dancing from Odo Ado to the Government House. They ended their procession at the partyâ€™s secretariat in Ajilosun. In its judgment delivered by Justice Suleiman Belgore, the tribunal said Fayemi was validly elected, contrary to the position of the PDP and Olusola. 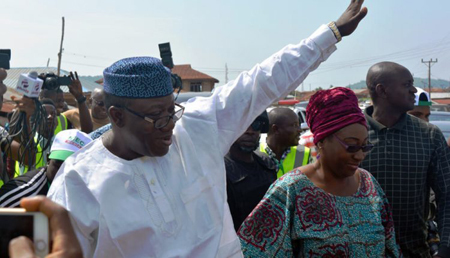 Fayemi polled 197,459 voted to defeat Olusola, who got 178,022 votes to become the runner-up. The tribunal began sitting in Ekiti last August before it relocated to Abuja, citing reasons of insecurity in the state. The APC members, who started their jubilation from Odo Ado, were led by a House of Representatives candidate in Ekiti Central Federal Constituency I, Sola Fatoba, and the Senior Special Assistant (SSA) to the Governor on Mobilisation, Tunji Ogunlola. Ogunlola, who addressed the crowd, said Fayemi worked hard to win the election and that the judgment confirmed the position of the party. The party supporters danced to the music supplied by a popular musician in Ekiti State. The long convoy of vehicles caused traffic congestion on Ado-Ikere-Akure road. The APC in the state had described the victory as expected, saying the party perpetrated no electoral fraud in the election to warrant the nullification and upturn its outcome. The stateâ€™s APC Deputy Chairman Sola Elesin said: â€œWe are happy over the outcome of the election, but we are not in any way surprised. This is because a transparent election was held on July 14, last year. It was clear that Governor Fayemi won fair and square. On the allegation that the shake-up in the Judiciary concerning the suspension of the Chief Justice of Nigeria (CJN), Justice Walter Onnoghen, was part of the alleged plot by APC to win at the tribunal, Elesin said: â€œThey only wanted to damage the reputation of the Judiciary. â€œWe had won two litigations since Fayemi came on board. He was taken to the court on his eligibility to contest the APC governorship primary and he won. He was taken to the Election Petitions Tribunal and he also came out victorious. But Olusola said the PDP would appeal the judgment. The former deputy governor, who spoke through the erstwhile Director of Media of his campaign organisation, Lere Olayinka, said: â€œThat is not the last bus stop as regards the Election Petitions Tribunal. Also, Ekiti State Deputy Governor Bisi Egbeyemi said Fayemiâ€™s victory at the tribunal would strengthen the APC in Ekiti ahead of the forthcoming elections. In a statement by his Special Assistant (SA) on Media, Odunayo Ogunmola, the deputy governor said: â€œWe thank God Who gave us this victory and we thank Ekiti people who voted for us and all our supporters all over the world. â€œThis will surely make us to have more friends and more supporters and victory is assured for President Muhammadu Buhari in Ekiti and other parts of Nigeria. The PDP said it will contest the verdict at the Court of Appeal.